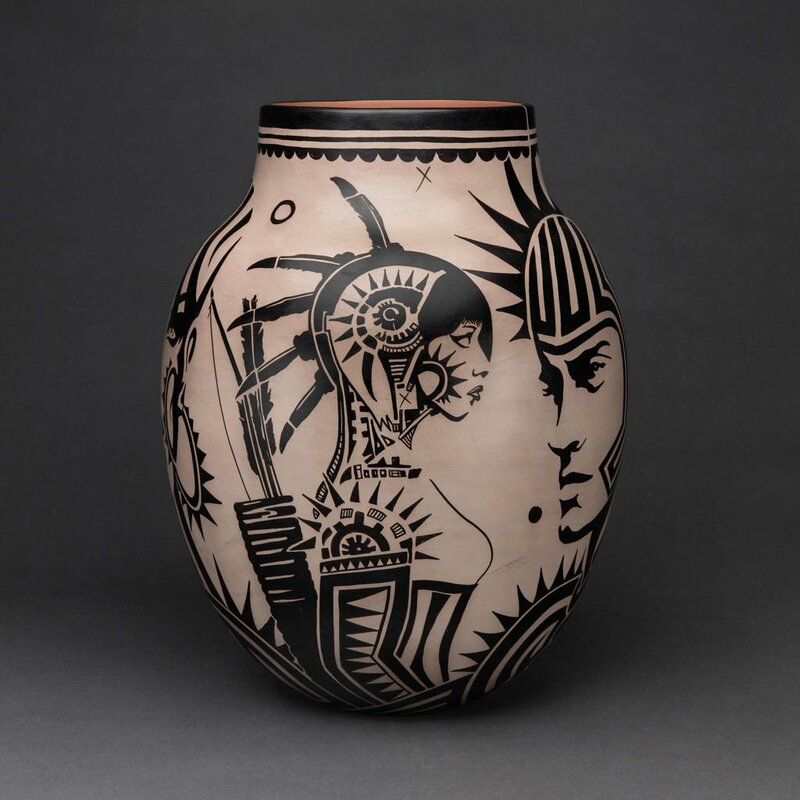 Revolt 1680/2180 Traditional Storage Jar; 2017; Cochiti red clay, white and red slip, black (wild spinach) paint; 16.5" x 11.5"
Imagine foreign forces abruptly entering your homeland, enforcing laws invalidating your religion, prohibiting expression of your culture, plundering your resources, and executing your family members and fellow citizens. Then, after nearly a century living under this oppressive force, seeing an indigenous counterforce from disparate enclaves unite behind a dynamic leader, rising up to drive the foreign invaders from the land and restore the lost culture. All of this actually occurred in what is now the Santa Fe/Taos area of New Mexico. The foreign force was the Spanish Conquistadors, and the victims were the Pueblo Natives of the area — events that culminated in the Pueblo Revolt of 1680. Under the leadership of tribal leader Po’pay, the revolt successfully overwhelmed Spanish forces, and although the area was reoccupied 12 years later, the events of 1680 are credited with preserving ancient Pueblo cultural traditions from extinction. If this exhibition were strictly a history lesson intermingled with traditional pottery, would we be talking about a contemporary ‘Revolution’? Not likely. But the strands of culture Ortiz’s art interweaves are nearly as diverse as the various media used to express it. And most of it is looking forward … in some cases, very far forward. Following Spanish reoccupation in 1692, native pottery that symbolized anything considered ‘religious’ (in a Native, non-Catholic way) was banned. As a result, everyday life and social commentary came to shape the design of Cochiti pottery, and by the 1880s the pottery began to feature more contemporary characters. But as the 19th Century came to a close, rigid Victorian attitudes frowned upon such caricatures, so this style of Cochiti pottery fell by the wayside. Ortiz grew up the son of potters — one of only a few families still making pottery using traditional Pueblo methods and materials — however, the caricature style was long gone by that time, and therefore not within his parents’ artistic scope. When Ortiz was a teenager, there was a pottery dealer from Albuquerque who occasionally traveled to the Pueblos to make acquisitions, and he was surprised to recognize themes in Ortiz’s work that were similar to the late-1800s Cochiti designs. He was curious to know where Ortiz was getting those ideas from, since it was not a style he had been exposed to. “I asked my parents to take me down to his showroom, and we walked in, and I was like, ‘What the heck is going on?’ because he had the largest collection of historic Cochiti pieces, and all of my pieces looked like that! My parents pulled me aside and said, ‘Did you see what just happened? It’s like the clay is talking to you.’ So at that age I decided I was dedicating my life to it,” Ortiz recalls. He didn’t start learning about contemporary potting techniques until about four years ago, when he met non-Native ceramicists via social media. “They’d ask, ‘Where do you get your clay from?’ He laughingly recalls, “And all those people who were non-Native couldn’t believe I would go dig my own clay … because all our materials, we’d get them from the earth.” This includes the wild spinach plant they use to paint the pottery, images of which are sprinkled throughout this exhibition. But, he continues, “That attracted people, so I was able to make a lot of connections.” And it was through these connections Ortiz learned about contemporary potting materials, which he has since incorporated into his work. The addition of other clay types, blown glass, and even built-in lights, along with his modernistic design approach give many of his pottery pieces a dazzling, space-age appearance. Although the exhibition reflects on 338-year-old events, other aspects of Ortiz’s work cast this neglected history 162 years forward — into a fantastical future. Seeing the original Star Wars movie when he was 7 years old sparked a lifelong interest in Sci-Fi movies and comic-book heroes for Ortiz. In time, he realized that this would be a palatable way to bring the story of the 1680 Revolt to today’s viewers, inspiring him to write a movie script that reimagines the revolt occurring both in 1680 — and simultaneously 500 years later in the year 2180 — with interplay occurring between the two eras. In the script he bestows the players with supernatural powers and sci-fi costumes. Other characters include: ‘Translator’ who communicates from outer space to Po’pay and Tahu in both the past and the future; ‘Watchmen’ who sound alarms of impending threats to their earth realm; ‘Runners’ (who historically relayed messages to tribal leaders to sync the timing of the 1680 revolt) are updated with futuristic gliders; ‘Aeronauts’ go back in time to collect artifacts and transport them to the future so people can learn from them. Movie set-quality costumes used in the film were designed by Ortiz and fabricated from raw materials. Mannequins displaying them are situated on opposing sides — Puebloans facing off against Castilians — as impressive video feeds play on the surrounding walls to tell the story. By melding historic events with modern media, Virgil Ortiz has created his own contribution to the canon of Pueblo folklore in a way that feels anything but archaic, effectively answering his ancestral calling to protect these traditions from extinction, and carry them forward for future generations to learn from. “Virgil Ortiz: Revolution — Rise Against the Invasion” exhibition runs through January 6, 2019 at the Colorado Springs Fine Arts Center at Colorado College. To learn more, visit csfineartscenter.org/exhibits/virgil-ortiz/.